Text Mapper is a web app to quickly generate a map based on a textual description of the map. The result is an SVG file and therefore scalable. A user sent me a little NodeJS script to rotate a map in order to get “stacked columns”. I wonder whether I should add a different hex stacking option to Text Mapper. I wrote a Mastodon bot: @textmapper. It posts a Text Mapper map once a day. It was surprisingly easy to do! I’m still confused by how easy it was. I was expecting some bugs. It... just worked!? I had great libraries to work with: Mastodon.py, CairoSVG, and all the other things I used. I’m also using the Software Wiki to keep track of ideas. On Google+, Zak asked for a tool that would generate both a map and a description of said map. Well, I have Text Mapper which creates beautiful maps, but I have no random tables to describe those maps. But I can work on that. And perhaps you can help? If you feel like contributing to this, feel free to leave your contributions in a comment on this blog, or tag me on Google+ or Mastodon, or contact me some other way. If you want, you can copy and paste this description into Text Mapper and it should regenerate the map shown above. I tried to use the format used by Abulafia. Take a look: Hex Describe. The work is ongoing. Let me know if you want to contribute. I think I’m done with all I wanted to do. The monster entries were based on the monsters in my H&H Ref Guide. I recently posted some examples of how to Traveller Subsector Generator – from the command line. Here’s how to do the same thing for Text Mapper. xmllint allows us to extract text from XML and HTML documents. On a Debian system, it’s part of libxml2-utils. You’ll note that at the very end it contains the seed value. You can use svgexport to generate a PNG image, if you want. You need to tell it what quality to use when exporting. I use 100% for PNG files; I’d use less for JPG files. I’ve been working on the Alpine map generator some more. It uses Text Mapper to render the output into an SVG image and it uses the Gnomeyland icons by Greg MacKenzie so it looks nice. Sadly, I’ve developed a pathetic obsession about getting it “right”. To illustrate my obsession and to help me fight it, let me document what I’m talking about. This is a “bug” I just fixed. Why would the river flow from 16.03 (height 7) to 15.04 (height 9)? This makes no sense. The key is the list of candidates after looking at the first round of neighbors: 1804 1603 1803 1703 1705 1604. These are sorted by height, 16.04 is last, which is great. But it also means that 16.03 (wrong direction: east into the mountains) is the equivalent of 17.05 and 18.04 (south east, towards lake 18.05). Clearly, I needed a better sorting algorithm for the next candidates to look for: the candidates at the same level needed to be sorted by their lowest neighbor which had not already been looked at. 1804 1705 1703 1803 1603 1604 is the correct sorting order. 18.04 and 17.05 are at the front and the southern passage is discovered. Notice my additional debug message I needed to check that for hex 17.03 the neighbor 17.04 is not checked. It would be the lowest neighbor indeed but we have already looked at it, so we need to ignore it. 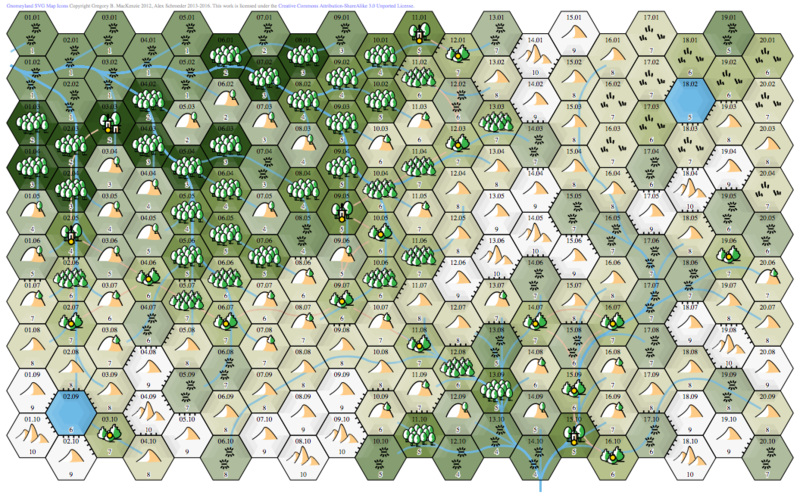 By the time we’re looking at 17.03, only the three northern hexes are options and 17.02 is indeed the lowest neighbor. And with this correction, the final map also looks different. No more canyon into the mountains! Now I get the urge to draw lines indicating the water divides. Noooo! And just in case I make further changes to the algorithm, here’s what the application would generate right now for this width, height, and seed. Time passes and I’ve spotted another problem in the map above. Take a look at lake 34.05 which drains through one of the highest peaks in the area, 35.07. How on earth did that happen? We need to look at the earlier maps again. Before the flood processor kicks in we can already see that any water on the peak 35.07 will immediately drain into lake 37.09.
look at all the neighbors of 34.05. None look very exciting, they all drain back into 34.05.
look at our neighbors’ neighbors; ignore the two white fields, focus on the light gray ones, e.g. 34.06. And that explains it. The problem seems to be that once we are looking at a candidate like 34.06, we’ll evaluate all its neighbors, even the very high ones like 37.09, even if a candidate of similar height like 35.05 has a much better neighbor like 36.05 which would drain off to the north west. My algorithm is not enough breadth first like water would be. More tinkering ahead, I can feel it! Algorithm changed to be totally breadth first. I’m not sure it is better. I’ve been playing around with Text Mapper again. The nice thing about it is that it’s easier to generate the text input for Text Mapper than it is to write a whole new program. What I wanted was to generate maps that remind of old drawings of the alps, like the one of the Wallis: Vallesia superior, ac inferior, Wallis, le Valais, by Gabriel Walser from 1768. There, you can download a 6208×5151 pixel image. Anyway, I’ve worked on this for two days and here we are! If you follow the link, you’ll get a random 20x10 hexmap using the new map generator, with the old SVG framework, and using the same old map icons by +Greg MacKenzie. There are still some things I think are annoying which is why I’ve left the “height” labels in as I need to think about this some more. There are a few more icons I think of using. What about large towns, cities, shrines? No bushes, I think. Where do single trees come in? Where to place a keep? What about using more colors, ocre and sienna maybe? The complete list of icons and colors can be seen in the Gnomeyland example. Also, anybody spotting stuff that defies explanation? Sometimes a river will drain to one side of a ridge – sometimes even appear to flow along side a lowland before turning away – and that is annoying. Perhaps these are opportunities to generate gorges? Anybody interested in talking about the algorithm I used? I didn’t put it into words but I might if you want to talk about it and prefer not to see any Perl code… And I definitely need to add a link to this somewhere in the web app. I’m hoping that cliffs make waterfalls obvious. I still keep thinking about a way to add shadows and lighting like Swiss Topographical maps have it. Take a look at this nearby hill. Note how subtle shadows indicate altitude changes without you having to read the altitude lines. I guess I like the look of the lakes. I’ve been working for many hours every day, working on better river flows, or basically better flooding of lakes and rivers cutting through higher surrounding areas searching for a passage, creating canyons as they cut through the land. Today I rewrote Text Mapper to be a Mojolicious application. I hope the important URLs still work exactly as they used to, so if you’re using Text Mapper as part of an application of yours, you should be fine. If not, let me know and I’ll see what I can do about it. Another big step forward are the examples on the Text Mapper Help page. You can click on the links to see the examples, live. This makes me very happy. These days, I use Text Mapper to maintain the player’s map for my Greyheim campaign. You can see it on the Greyheim Region page. The reason I rewrote the application was that I actually wanted to write a new algorithm to generate maps – maps that would look like Swiss maps: rivers, ranges of hills and mountains, passes, all of that.